Chicken and shrimp go together surprisingly well, and this dish is no exception. Garlic, basil, and simple Italian-style seasonings flavor the chicken and shrimp mixture. The flavors are similar to garlicky shrimp scampi. 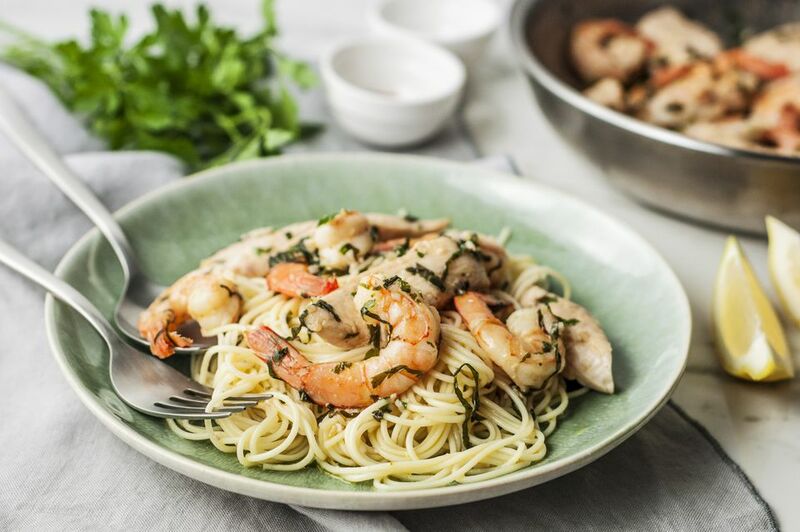 Serve this chicken and shrimp combination with cooked linguine, angel hair pasta, noodles, or hot boiled rice. Add a tossed green salad or Caesar salad for a well-rounded meal suitable for any occasion. Cut boneless chicken breast halves into strips or use chicken tenders in the dish. As with many savory dishes, there are lots of ways you can tailor it by adding ingredients or making substitutions. Add a small minced shallot or a few tablespoons of scallions to the butter and olive oil along with the garlic and seasonings. Or add about 1/4 cup of finely chopped bell pepper or 6 to 8 ounces of sliced mushrooms to the skillet. And feel free to use all chicken or all shrimp in the dish. Chicken and ham is a great combination as well. One reader suggested serving the dish with hot cooked pasta along with a bowl of Alfredo sauce on the side. Lightly pound chicken between sheets of plastic wrap to an even thickness. Cut the chicken into strips about 1-inch wide. To peel the shrimp, draw the tip of a small, sharp knife down the back of a shrimp. Remove the dark vein or coax it out with the knife. Repeat with the remaining shrimp. Rinse the shrimp under cold running water and then pat them dry with paper towels. In a large skillet over medium heat, melt the butter with olive oil. When the butter stops foaming, add the garlic, basil, parsley, salt, and seasoning. Reduce the heat to medium-low heat and add the chicken and shrimp. Cook the shrimp and chicken mixture, stirring, for about 10 to 15 minutes, until cooked through. If shrimp are small, add them a few minutes after adding the chicken. The shrimp will be opaque and pink when done. Spoon the chicken and shrimp mixture over hot cooked pasta or rice for serving. Sprinkle with fresh chopped parsley, if desired. If you are using frozen cooked shrimp, thaw them in the refrigerator and add them about 5 minutes before the dish is done, or cook just long enough to heat the shrimp thoroughly.